It's June and wedding season has officially opened (although I know they happen all year ... I was married in May). Engagements and weddings bring together friends and family from both the bride and grooms side. There's many social occasions - engagement parties, bridal showers, wedding breakfasts or luncheons and receptions - bringing many people together. Help break the ice by playing Wedding Shout Out. It's so easy that children can join in, but challenging for even the most competitive of adults. Each card has one, and only one, match with every other card on the deck. Find your match first and Shout Out. Get the most matches and WIN! First time players learn in seconds how to play. Soon the bride and groom's friends and families will be laughing and playing together like long lost friends. Or add a game as a card for the bride and groom attached to a gift or gift card. 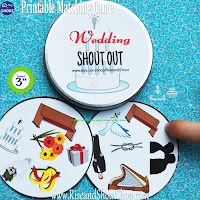 A personalized Wedding Shout Out would also make an ideal Save the Date announcement, Wedding Favor or gift for the flower girl or ring bearer. Just contact me for details. Click here for Wedding Shout Out. How great!! Thanks for this wonderful information my friend. I am also getting married at outdoor event space NYC and was searching for wedding theme inspirations and liked vintage themes the most. I would ask the planner to arrange a memorable vintage wedding party for us on our budget.